Every year since 2002 on the first Saturday in May, we celebrate the best holiday of them all; Free Comic Book Day! On this day you can venture into your local participating comic book store and walk out with special comic books for free! Many shops even celebrate the day by bringing in special guests and costumed heroes! 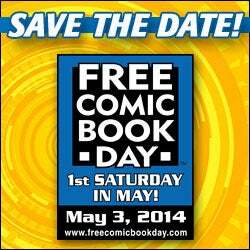 2014 will be no different, as this Saturday is once again Free Comic Book Day! Venture over to FreeComicBookDay.com and discover which shops are participating and what this year's swag is like. Still not convinced? Why not let LeVar Burton make up your mind?